With so many Americans underwater with their homes, it should not be surprising that many people have elected to walk away from their homes and file for bankruptcy. 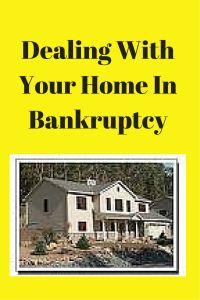 Chapter 7 bankruptcy allows for the liquidation of property, real and personal. The debtor has the opportunity in a chapter 7 bankruptcy case to surrender items that are secured by a lien. This often falls within the nature of a vehicle. However, it’s becoming more and more common to see it be in the nature of a home. This option is available provided the debtor qualifies for chapter 7 bankruptcy relief. If the debtor does not qualify for chapter 7, he may qualify for chapter 13 bankruptcy. A debtor in chapter 13 can also decide to surrender real estate and not reorganize it through a chapter 13 plan. What will typically happen in this case is that the lender will be able to foreclose on the property, sell it at auction and then file an unsecured claim for the deficiency. In some cases, the lender simply does not file a deficiency claim and the debtor is relieved of his obligation on the note. For this reason, it is difficult to predict or advise a client as to what the actual amount being repaid is going to be. However, the debtor can rest assured that the secured portion of the debt will be eliminated. There are also cases where the debtor keeps the home but eliminates some of the mortgage debt. This would be a chapter 13 bankruptcy case where a second mortgage or third mortgage is completely unsecured. In those circumstances, the debtor can strip the lien on those mortgages and pay them back just like unsecured creditors. The lender in the first position remains intact in this circumstance. It is only the second or third or other unsecured mortgage that gets stripped that loses it secured nature. As you can see, there are many options with regard to how real estate is treated in bankruptcy. It could be retained and repaid in either a chapter 7 or chapter 13. It can be surrendered in either chapter with nothing owed in a chapter 7 and a potential deficiency owed in a chapter 13. It can also be stripped if it the second or third mortgage is totally unsecured. Your individual circumstances are going to depend upon the facts of your case and how the numbers play out. If you are struggling with your home and you want to know what options you have under the bankruptcy code, you can contact me at 847-520-8100. I will sit down with you and do a no cost, no obligation consultation to see how the laws could be utilized to help you gain some form of relief.